i dreamt there were zombies attacking us. it’s strange because this night i was well equipped, with both a heater running and the electric mat. so no cold air induced nightmares were supposed to pop up. well the zombies were attacking us, and at some point me and some other people had the role of a rescue team, so we smashed into the school office style room shooting guns, and killed some of the zombies. 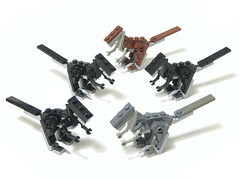 they were so fast, they were kind of like velociraptors from jurassic park. and slowly they morphed into them over time. there was a metallic cabinet on the right corner. it was semi-open. some of the team crew were approaching it, and i told them to hold off, and opened it from a distance by kicking the door. there was a strange saliva hanging inside the cabinet. then the zombiraptor dropped down from a space above that wasn’t visible from outside the cabinet, and assaulted a civilian to my left. i couldn’t shoot at it, as it was too close, and grabbed a hammer and hit the zombieraptor in the head while it was desecrating the civilian live. i managed to kill the zombieraptor but i think one of the last few blows also killed the civilian, as its head was right behind the zombieraptor’s hocico. then i woke up. phew, scary.